8.11.2017, Strasbourg - As part of his visit to Strasbourg, First Deputy Minister of Foreign Affairs of Georgia David Zalkaliani held a meeting with CoE Secretary General Thorbjørn Jagland. David Zalkaliani provided the Secretary General with detailed information about the grave humanitarian situation in Georgia's occupied regions and the latest developments around the Georgia-Russia conflict. 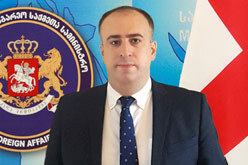 According to the First Deputy Foreign Minister, it is highly important that issues relating to Georgia's occupied territories are kept high on the international community's agenda. In this regard, he highlighted the importance of the Secretary General's consolidated reports containing objective information on the developments in the Abkhazia and Tskhinvali regions, in particular, on mass destruction of houses of ethnic Georgians, closure of the so-called checkpoints, so-called borderization process, restriction of free movement, persecution on ethnic lines, etc. The Secretary General reaffirmed the CoE's unequivocal support for Georgia's sovereignty and territorial integrity pledging that he will continue to release consolidated reports. The Secretary General expressed his particular concern over the banning of the native language instruction in the occupied territories. The sides emphasized the importance of granting the international organizatons' monitoring mechanisms an access to Georgia's occupied territories. Talking points also include the Georgian Government's steps towards confidence building and policy of engagement. The importance of the Geneva International Discussions in peaceful resolution of the conflict was also highlighted. David Zalkaliani and Thorbjørn Jagland also discussed issues relating to current and future co-operation between Georgia and the Council of Europe, including the state of Georgia's implementation of the projects under the CoE Action Plan. According to the CoE Secretary General, the Council of Europe, for its part, will continue its efforts to obtain financial support for the Action Plan. Within the framework of his visit, David Zalkaliani also met with the Permanent Representatives of the CoE Member States updating them in detail on the recent developments in Abkhazia and Tskhinvali region, as well as on the Georgian Government's efforts to peacefully resolve the conflicts. The Permanent Representatives expressed their close interest in the situation in the occupied territories and the state in which internally diplaced persons live.